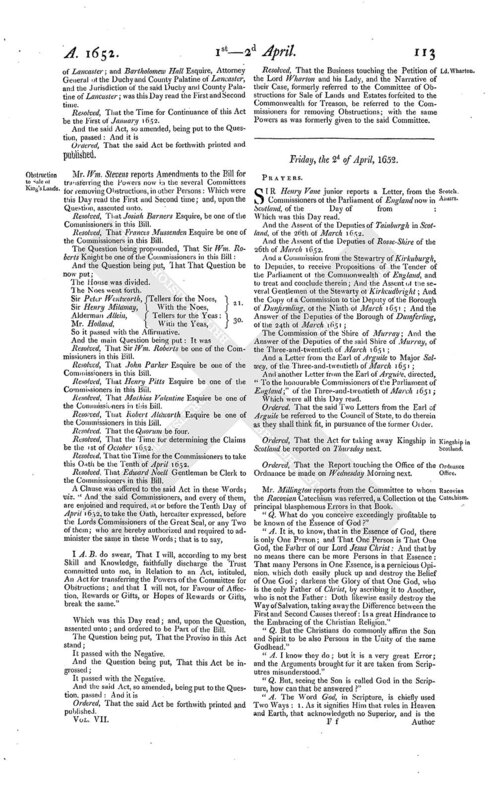 Friday, the 2d of April, 1652. SIR Henry Vane junior reports a Letter, from the Commissioners of the Parliament of England now in Scotland, of the Day of from: Which was this Day read. And the Assent of the Deputies of Tainburgh in Scotland, of the 26th of March 1652. And the Assent of the Deputies of Rosse-Shire of the 26th of March 1652. Which were all this Day read. Ordered, That the said Two Letters from the Earl of Arguile be referred to the Council of State, to do therein as they shall think sit, in pursuance of the former Order. Ordered, That the Act for taking away Kingship in Scotland be reported on Thursday next. Ordered, That the Report touching the Office of the Ordnance be made on Wednesday Morning next. 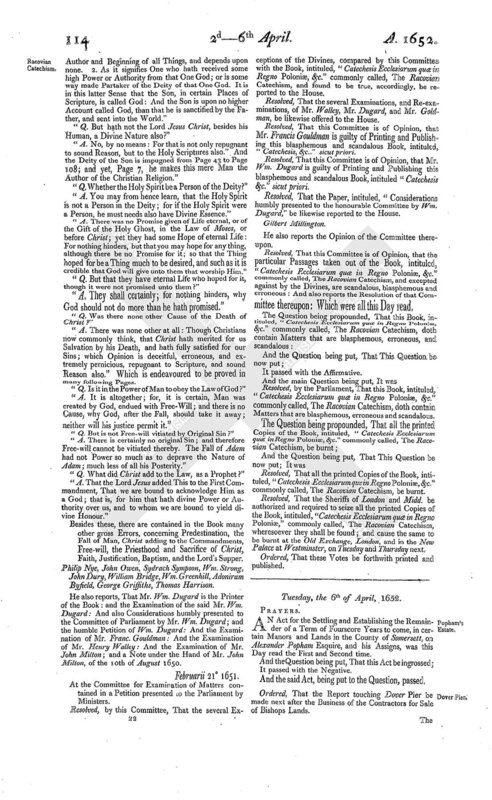 Mr. Millington reports from the Committee to whom the Racovian Catechism was referred, a Collection of the principal blasphemous Errors in that Book. "Q. What do you conceive exceedingly profitable to be known of the Essence of God?" "A. It is, to know, that in the Essence of God, there is only One Person; and That One Person is That One God, the Father of our Lord Jesus Christ: And that by no means there can be more Persons in that Essence: That many Persons in One Essence, is a pernicious Opinion, which doth easily pluck up and destroy the Belief of One God; darkens the Glory of that One God, who is the only Father of Christ, by ascribing it to Another, who is not the Father: Doth likewise easily destroy the Way of Salvation, taking away the Difference between the First and Second Causes thereof: Is a great Hindrance to the Embracing of the Christian Religion." "Q. But the Christians do commonly affirm the Son and Spirit to be also Persons in the Unity of the same Godhead." " A. I know they do; but it is a very great Error; and the Arguments brought for it are taken from Scriputres misunderstood." " Q. But, seeing the Son is called God in the Scripture, how can that be answered?" " A. The Word God, in Scripture, is chiefly used Two Ways: 1. As it signifies Him that rules in Heaven and Earth, that acknowledgeth no Superior, and is the Author and Beginning of all Things, and depends upon none. 2. As it signifies One who hath received some high Power or Authority from that One God; or is some way made Partaker of the Deity of that One God. It is in this latter Sense that the Son, in certain Places of Scripture, is called God: And the Son is upon no higher Account called God, than that he is sanctified by the Father, and sent into the World." "Q. But hath not the Lord Jesus Christ, besides his Human, a Divine Nature also?" " A. No, by no means: For that is not only repugnant to sound Reason, but to the Holy Scriptures also." And the Deity of the Son is impugned from Page 43 to Page 108; and yet, Page 7, he makes this mere Man the Author of the Christian Religion." "Q. Whether the Holy Spirit be a Person of the Deity?" "A. You may from hence learn, that the Holy Spirit is not a Person in the Deity; for if the Holy Spirit were a Person, he must needs also have Divine Essence." "A. There was no Promise given of Life eternal, or of the Gift of the Holy Ghost, in the Law of Moses, or before Christ; yet they had some Hope of eternal Life: For nothing hinders, but that you may hope for any thing, although there be no Promise for it; so that the Thing hoped for be a Thing much to be desired, and such as it is credible that God will give unto them that worship Him." "Q. But that they have eternal Life who hoped for it, though it were not promised unto them?" "A. They shall certainly; for nothing hinders, why God should not do more than he hath promised." "Q. Was there none other Cause of the Death of Christ?" "A. There was none other at all: Though Christians now commonly think, that Christ hath merited for us Salvation by his Death, and hath fully satisfied for our Sins; which Opinion is deceitful, erroneous, and extremely pernicious, repugnant to Scripture, and sound Reason also." Which is endeavoured to be proved in many following Pages. "Q. Is it in the Power of Man to obey the Law of God?" "A. It is altogether; for, it is certain, Man was created by God, endued with Free-Will; and there is no Cause, why God, after the Fall, should take it away; neither will his justice permit it." "Q. But is not Free-will vitiated by Original Sin?" "A. There is certainly no original Sin; and therefore Free-will cannot be vitiated thereby. The Fall of Adam had not Power so much as to deprave the Nature of Adam; much less of all his Posterity." "Q. What did Christ add to the Law, as a Prophet?" "A. That the Lord Jesus added This to the First Commandment, That we are bound to acknowledge Him as a God; that is, for him that hath divine Power or Authority over us, and to whom we are bound to yield divine Honour." Besides these, there are contained in the Book many other gross Errors, concerning Predestination, the Fall of Man, Christ adding to the Commandments, Free-will, the Priesthood and Sacrifice of Christ, Faith, Justification, Baptism, and the Lord's Supper. Philip Nye, John Owen, Sydrach Sympson, Wm. Strong, John Dury, William Bridge, Wm. Greenhill, Adoniram Byfield, George Griffiths, Thomas Harrison. He also reports, That Mr. Wm. Dugard is the Printer of the Book: and the Examination of the said Mr. Wm. Dugard: And also Considerations humbly presented to the Committee of Parliament by Mr. Wm. Dugard; and the humble Petition of Wm. Dugard: And the Examination of Mr. Franc. Gouldman: And the Examination of Mr. Henry Walley: And the Examination of Mr. John Milton; and a Note under the Hand of Mr. John Milton, of the 10th of August 1650. At the Committee for Examination of Matters contained in a Petition presented to the Parliament by Ministers. Resolved, by this Committee, That the several Exceptions of the Divines, compared by this Committee with the Book, intituled, " Catechesis Ecclesiarum quæ in Regno Poloniæ, &c." commonly called, The Racovian Catechism, and found to be true, accordingly, be reported to the House. Resolved, That the several Examinations, and Re-examinations, of Mr. Walley, Mr. Dugard, and Mr. Goldman, be likewise offered to the House. Resolved, That this Committee is of Opinion, that Mr. Francis Gouldman is guilty of Printing and Publishing this blasphemous and scandalous Book, intituled, "Catechesis, &c.." sicut priori. Resolved, That this Committee is of Opinion, that Mr. Wm. Dugard is guilty of Printing and Publishing this blasphemous and scandalous Book, intituled "Catechesis &c." sicut priori. Resolved, That the Paper, intituled, "Considerations humbly presented to the honourable Committee by Wm. Dugard," be likewise reported to the House. He also reports the Opinion of the Committee thereupon. Resolved, That this Committee is of Opinion, that the particular Passages taken out of the Book, intituled, "Catechesis Ecclesiarum quæ in Regno Poloniæ, &c." commonly called, The Racovian Catechism, and excepted against by the Divines, are scandalous, blasphemous and erroneous: And also reports the Resolution of that Committee thereupon: Which were all this Day read. Resolved, by the Parliament, That this Book, intituled, "Catechesis Ecclesiarum quæ in Regno Poloniæ, &c." commonly called, The Racovian Catechism, doth contain Matters that are blasphemous, erroneous and scandalous. Resolved, That all the printed Copies of the Book, intituled, "Catechesis Ecclesiarum quein Regno Poloniæ, &c." commonly called, The Racovian Catechism, be burnt. Resolved, That the Sheriffs of London and Midd. be authorized and required to seize all the printed Copies of the Book, intituled, "Catechesis Ecclesiarum quæ in Regno Poloniæ," commonly called, The Racovian Catechism, wheresoever they shall be found; and cause the same to be burnt at the Old Exchange, London, and in the New Palace at Westminster, on Tuesday and Thursday next. Ordered, That these Votes be forthwith printed and published.